Hip black and white geometric print on a heather black tee. ***lil threadz loves custom orders! If you don't see a theme or print that floats your boat in the shop please contact me to arrange a custom order. 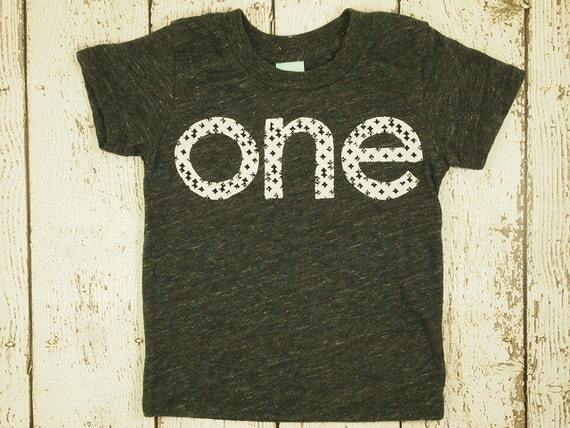 All shirts are available for birthday "1/2" "One" "Two" "Three" "Four", "Five", "Six". Additional birthdays and shirt sizes available as a custom request. There is an ADDITIONAL fee for "THREE" (+ $4) and "FOUR" (+ $2) and "FIVE" (+$2) based on the fabric and time requirements. Please use this link to conveniently add the additional letters for FOUR to your order http://www.etsy.com/listing/83825278/additional-letters-for-your-lil-threadz. Shirt can be customized with child's name on back for $2 per letter. For more information about the shirts, please see sizing/color chart in the product images. Would you like a shirt in size 3-6 months? Youth sizes 8 and higher? Adult sizes? They are also available!Please note - limited colors available. Please contact us with what size you are looking for and we can tell you what colors we have in that size. We can set up a custom listing for you to purchase as well. Most items are completed and shipped within the processing times listed below (right above ship to quotes) Custom orders that require out of stock fabrics or shirts can take up to 10 days longer. I ship via USPS First Class. This does not include insurance towards loss and damage. If you require that, please contact me BEFORE placing your order. I do use delivery confirmation on all orders. I also offer USPS Priority shipping for $5.95. Please contact shop before purchasing if you prefer to ship Priority. Each lil threadz design is made by hand, from start to finish. Each appliqué uses fun and unique fabrics and is sewn on to top quality shirts by Alternative Apparel. The designs are hand-cut, applied to the shirts using a non-toxic adhesive and then sewn securely to the fabric. lil threadz is truly concerned about what types of dyes and chemicals linger on the clothes we place on our kids each day. Most of the shirts are super soft, eco-heather which is a uniquely imperfect blend of organic cotton, recycled polyester, and naturally occurring rayon. Care Instructions: We suggest you wash this item inside out either by hand or in a normal wash cycle. Either dry on low or let the shirt air. lil threadz..... a lil bit of heart goes into each stitch.